took my new old car on its first 400km trip thru europe. 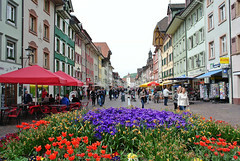 freiburg, germany, is a small nice colorful romantic town, then thru the black forest mountains to donaueschingen, which has the danube springs, so i paid respect, then to stein am rhein, an extemely picturesque little town where the rhein comes out of the bodensee. July 30, 2007 in Places.